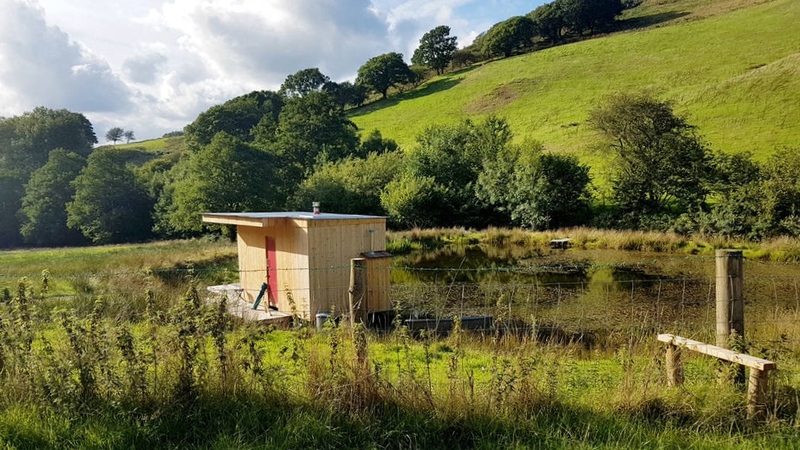 Caban Cilfa is our newest addition to the lush green hillside. 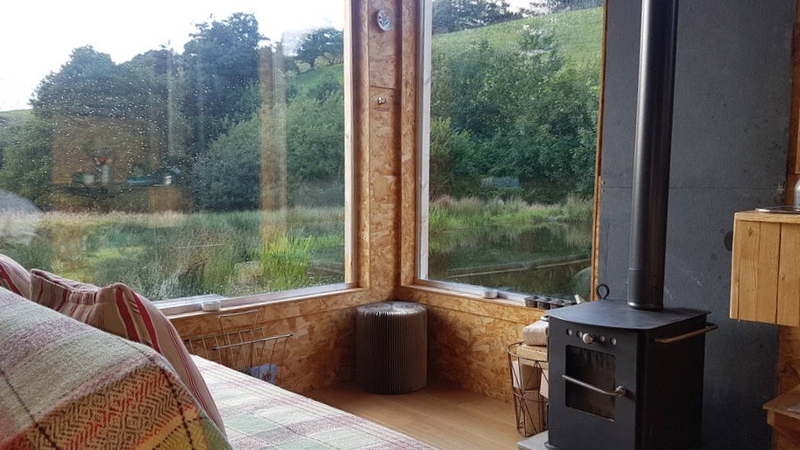 This compact and cosy retreat is nestled by the side of a small lake – offering wildlife viewing right from the deck and large windows. Bring your binoculars, boots or bikes to fully enjoy the breathtaking scenery by day and dark star-filled skies by night. The main living space includes a sofa and wood burning stove, with large feature windows looking out onto the lake, and hills beyond. Cabin Cilfa is just 2.4m wide and 4.8m long, but also contained within this neatly designed space is a basic kitchen with induction hob, sink and storage with coolbox. A double bed sits at the other end, along with a separate internal bathroom with hot shower, basin and compost loo. There is a solar system for lighting and USB charging socket. Outside you can enjoy the tranquil lakeside setting from the connected decking area, as well as Walking, Trail Running and Biking right from the doorstep. If you’re feeling brave, take a dip in the pond to cool off when you get back! Check in time is 4.00pm. 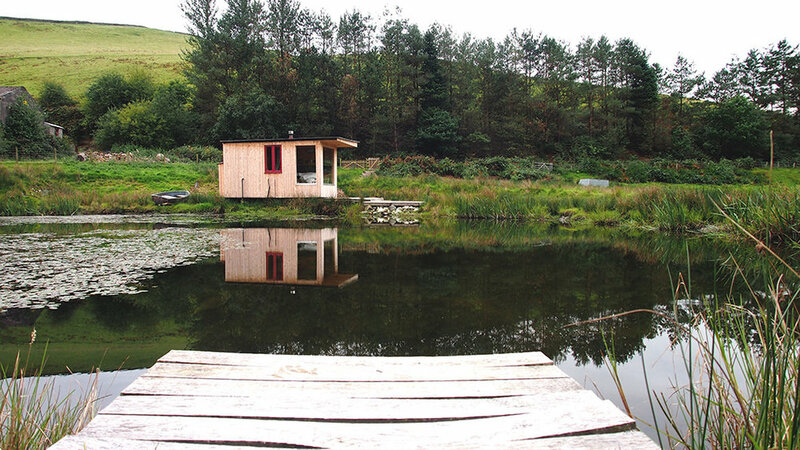 The caban is sited in a lakeside area on a working farm. Dogs should be kept on a lead on all times. Lambing Season (Early March to End of April). There are light fittings in all rooms. There is good 3G mobile signal on most networks. Extra space for 1 adult on sofa bed. Children are welcome, although there is only limited space on the basic sofa bed. Dogs may be brought as long as they are kept on a lead. Space for 1 pet from £10 per pet per stay. The basics (Tea Bags, Salt and Pepper, Olive Oil, Sugar) are provided and will be waiting for you on arrival. There's an LPG hob and kettle and a cool box to keep a few cold drinks in for your return from the trails. For washing up there's a compact sink with hot and cold running water. The shower and the loo are built into the cabin itself. Please bring your own shampoo/ shower gel etc. Bed linen & towels are provided for 2 people. You will need a torch if you arrive in the dark as many locations have no outside lighting. Internal lighting is via a solar system, torches/lanterns are provided as back-up in winter months. Selection of Books, Cards and Board Games in the Caban. Dark skies and stars, lake-side wildlife spotting.